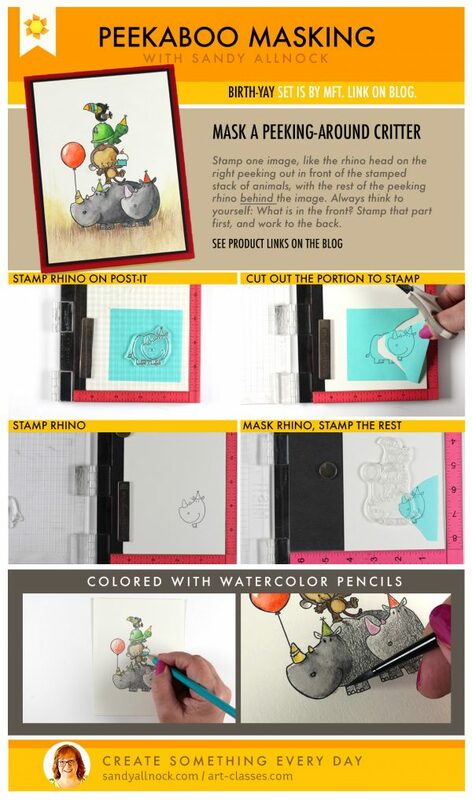 As soon as I saw the Stamped Just For You stamp set from Hero Arts, I had two thoughts: 1) It’s genius; and 2) of COURSE it’s by Hero. 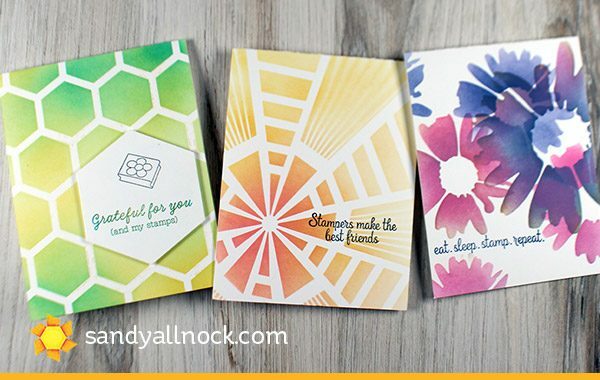 They’re such a great promoter of stamping and drawing new people into the craft – and this is an idea right up their alley! 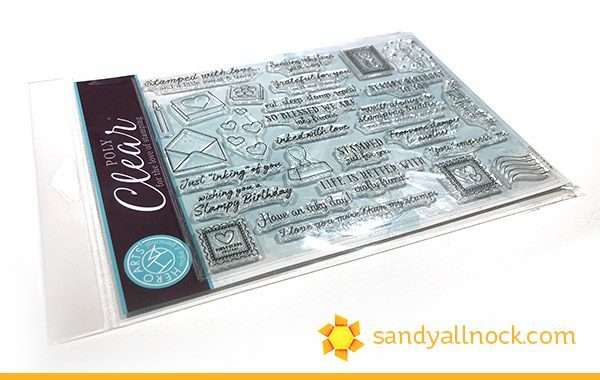 It’s a huge stamp set – and is a little more expensive than their usual price because of it. 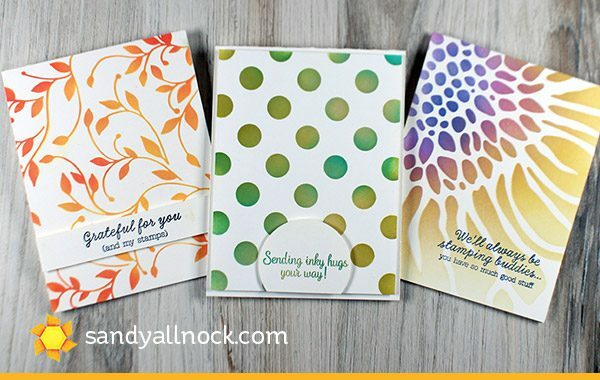 But it’s so worth it – I made a dozen cards for this post to show you a whole bunch of the sentiments – and they work on fronts or backs or envelopes. 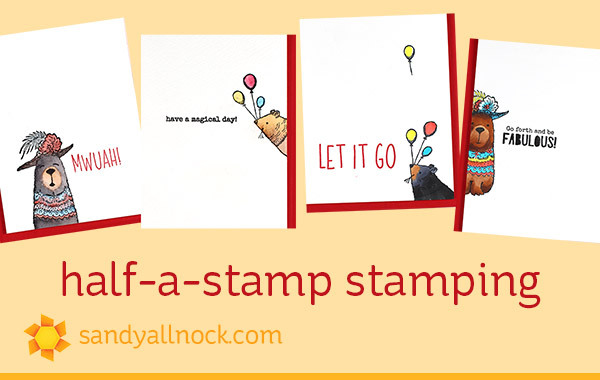 There’s not a lot of stamp sets that I think this highly of, but when it comes to great sentiments, let’s just say…this stamp set ain’t goin in the prize boxes any time soon, I like it that much. I don’t have tutorials for these – but lemme tell you a little of what I did. I played with the “life changing” brushes. I bought the small set first thinking more brushes = more value. Uhm. nope. I do not like the tiny ones at all. I know some folks love them but I found them incredibly difficult. The BIG brush in one set though is relatively awesome. 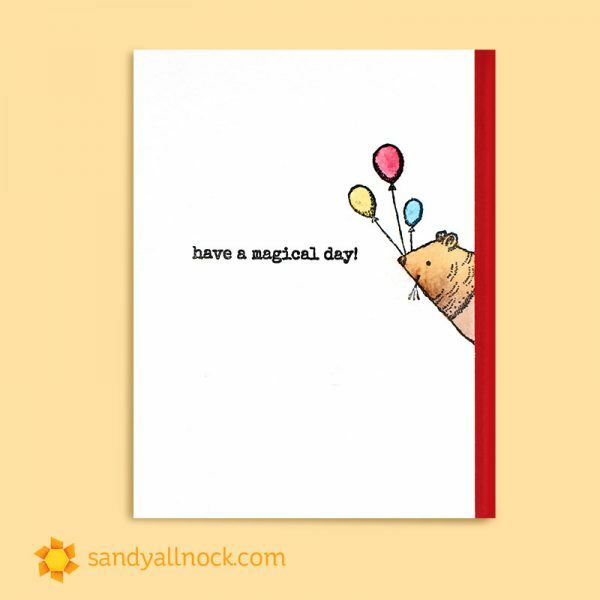 It still leaves a blob, and I need lots of practice to figure out how not to blob – thus all the cards today! Before the comments about alternate cheap versions of these brushes: I will be deleting any such comments. Cheapie Amazon-land is not part of my lexicon here, you might have noticed; I only link to reputable craft retailers, only those who do business with integrity, and only to Amazon if I cannot find the item at an arts or crafts shop. I ask your cooperation in letting my blog remain as craft-supportive as possible. Thanks! The square black metal “plate” is the surface I use when doing messy inky things – it’s called a Craft Assistant, and since it’s metal it won’t crinkle, and it’s also 12×12 so it’s not totally huge and taking over my space. Cleans up great! These cards are all going out in the prize boxes from the Playjournal giveaway. 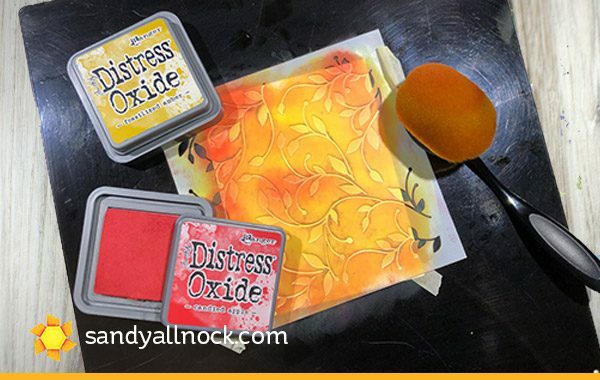 Only a few of these stencils used are still available…I haven’t bought many stencils of late, so only a couple are recent and linked in the supplies at the end. 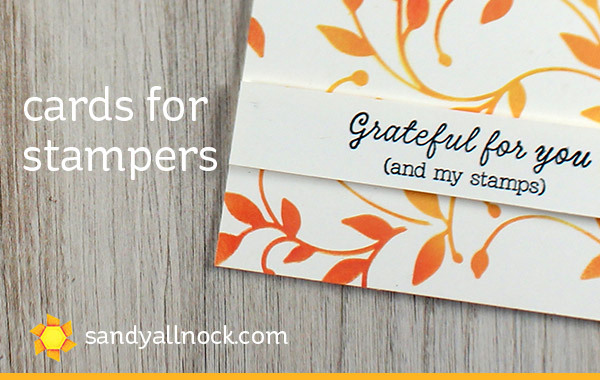 Sentiments: Grateful for you (and my stamps) ; Stampers make the best friends; eat sleep stamp repeat. 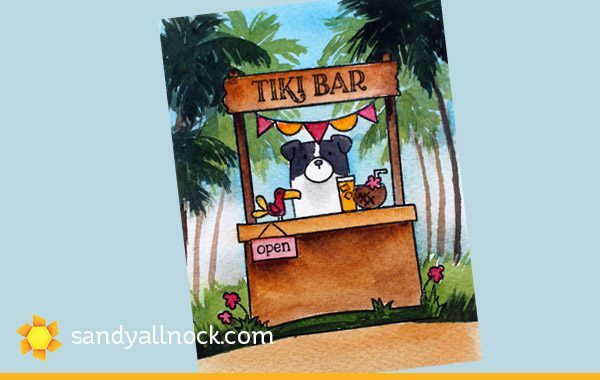 A llama walked into a tiki bar….. I know there’s a joke here somewhere, right? Ha! 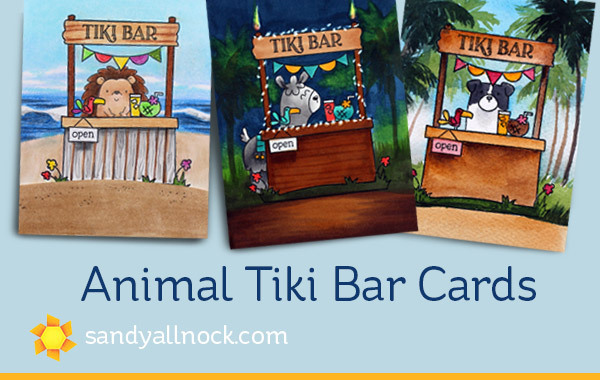 Well the Market Stand stamp set from Avery Elle – combined with Peek-A-Boo Pets (there are several animals, it’s so cute!) 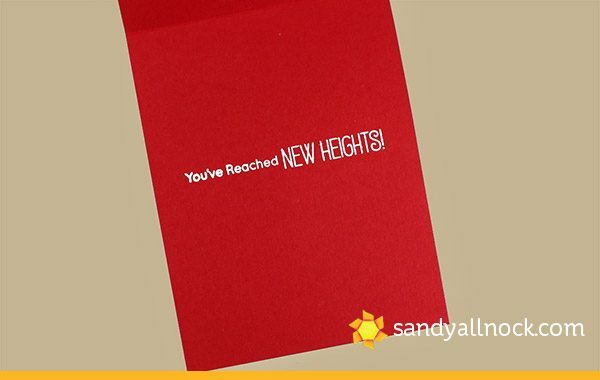 and Llamazing – inspired my three cards for today! Scroll down for detail on each one. Which is your favorite? 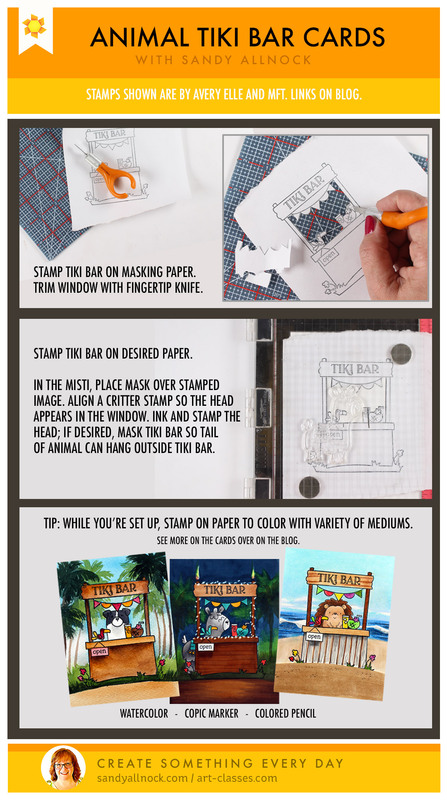 I’ve put together a little graphic for your pinning pleasure – click on the image to make it bigger, but be sure to pin it from here so you can get back to the blog post. 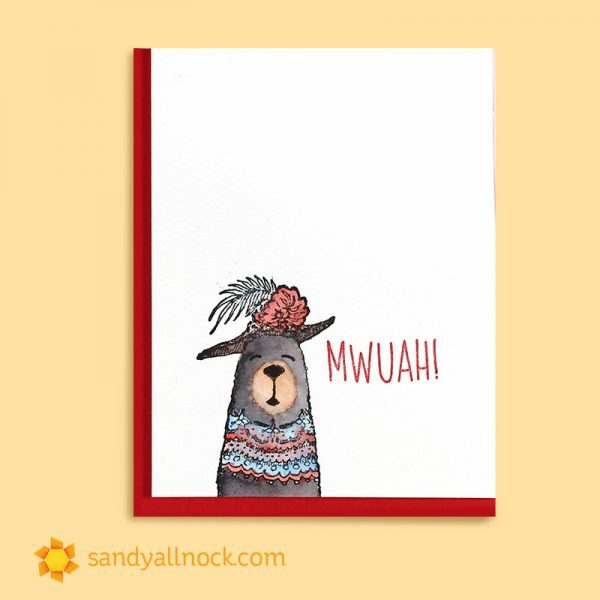 I made three versions of this card – in three different coloring mediums! While I stamped one of them I figured I’d do it on several kinds of paper. 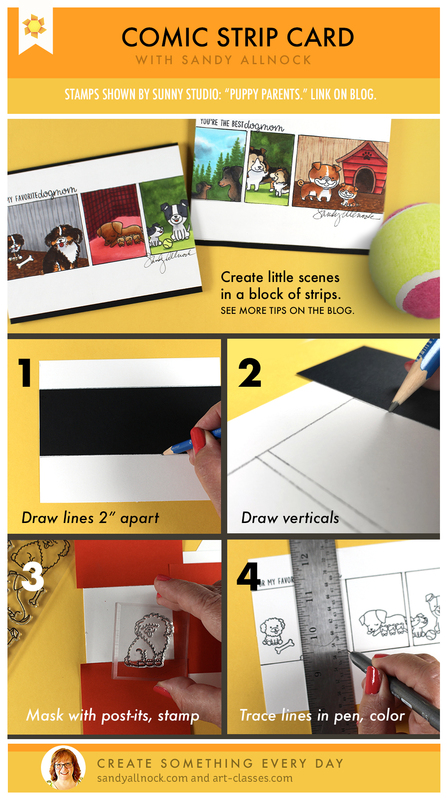 The good thing – I could use Lawn Fawn, Jet Black Ink because it works with all three mediums I wanted to color with! Ps: since it’s the first day of spring, it’s also free ice cream cone day at DQ! 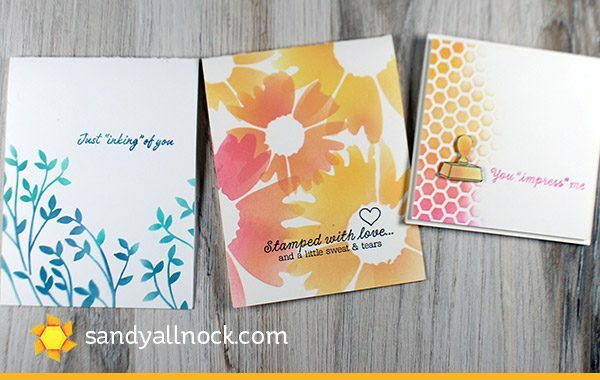 Sometimes less is more….and sometimes half a stamp is all you need! 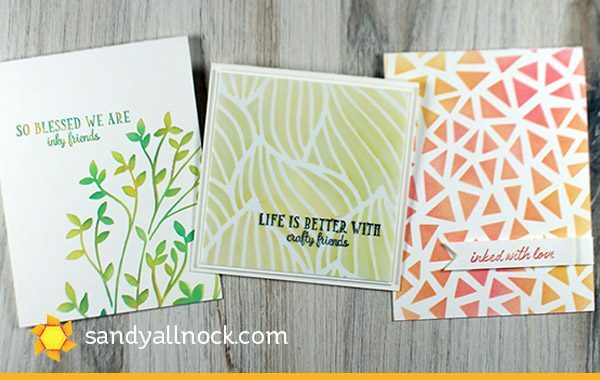 The cool part about stamping only part of an image – or only including half an object on a canvas, for that matter – is that it gets the viewer engaged. They imagine what else is there. They’re intrigued by just what is going on there. 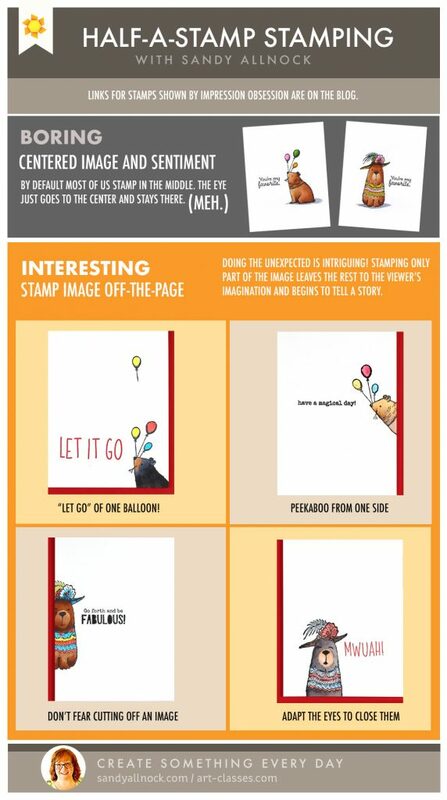 In each of the examples in this post, I went through my stamp collection to find sentiments that would start the idea of a story going – scroll down to see a little more on each one. Click the graphic to make it larger – but pin from this blog post rather than the attachment, so you can get back here to the images below. 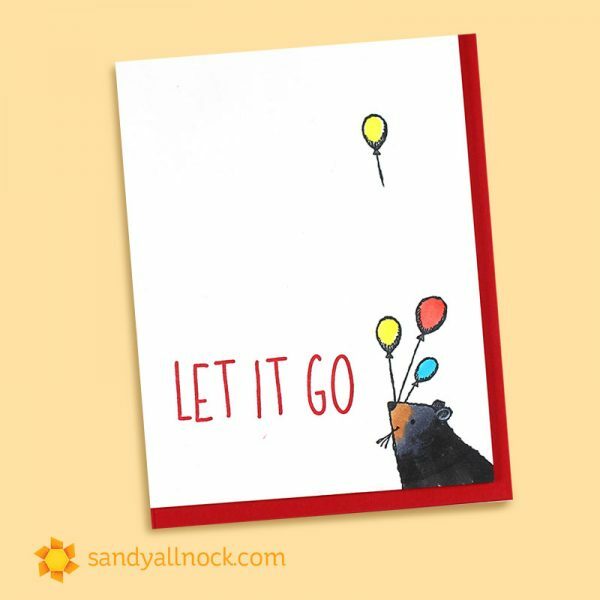 At first I only had the Balloon Bear peeking in from the bottom, and as I looked for a sentiment to go with him, I saw “Let it go….” and immediately had to stamp one more balloon up in the air as if he’d let it go! 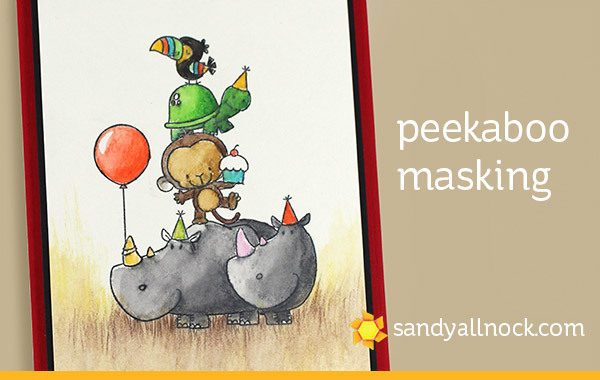 Fancy Hat Bear, when peeking in from the side, is a little shy. 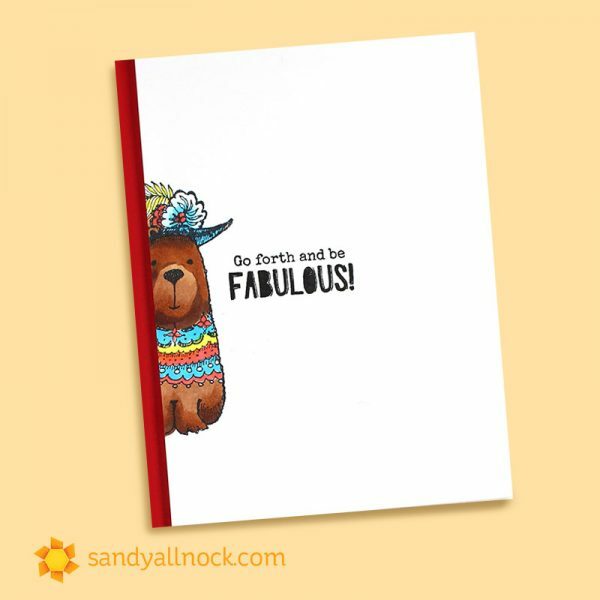 So telling her to go be fabulous in a sentiment seemed good to encourage her to step out boldly! In another version of Fancy Hat Bear, I wanted her to look like she was throwing a kiss, so when stamping her I wiped off the eyes – and added lines instead so she could look dreamy! Sometimes you have an image that needs to play hide and seek. To somehow peek around another image that is on the card. 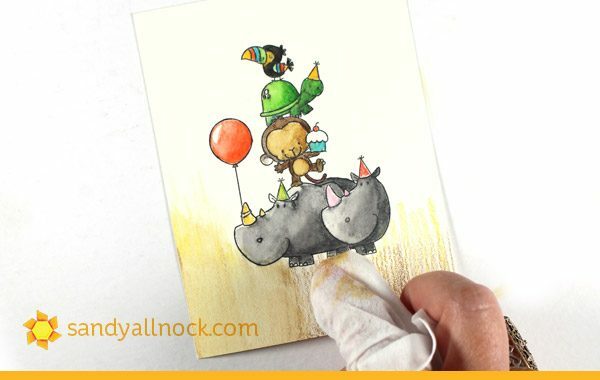 Like the 2nd rhino on my card in the Birth-Yay stamp set from MFT – the rhino on the left is part of one large stack of animals in one stamp…but the extra rhino is just by himself. Always be thinking about which image is in the front. In this scene, the head of the rhino on the right is in the front. Then the other rhino, then behind it all is the back of the rhino. In this case, there was only a little curve-of-the back that could have been stamped, but a pen did the job easily. The sentiment stamp I picked didn’t really fit on the front nicely…so I put it inside. 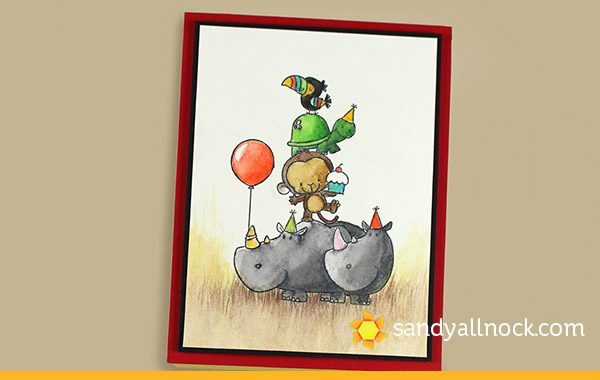 There are lots of birthday sentiments in this set, but I used the more generic one so I can send this card as any kind of celebration! The grasses, by the way, were just scribbled Albrecht Durer Watercolor Pencils which I smooshed around with a baby wipe to get that nice soft blending! 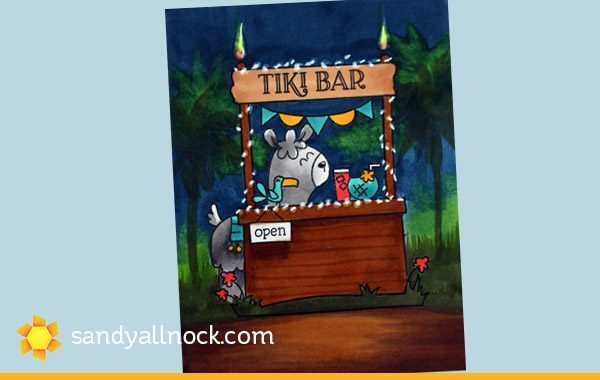 The finished card is just mounted on layers of cardstock. Super cute! The Best Dog Mom contest was sooooo hard to judge. So many awesome dogmoms and pupperkids!!! But…there can only be two crowns so here goes…Send me your addies and I’ll pack up the goodies! 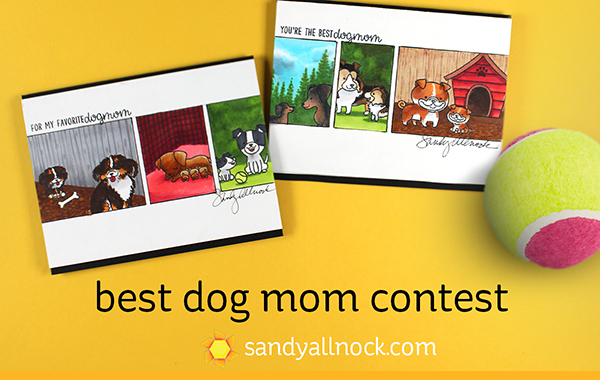 Best Dog Mom Card + contest! 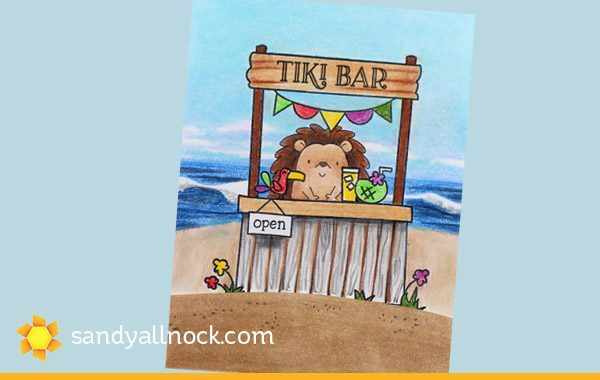 I made some cute Comic Strip cards – with a much easier technique than the one I did HERE a few years back. 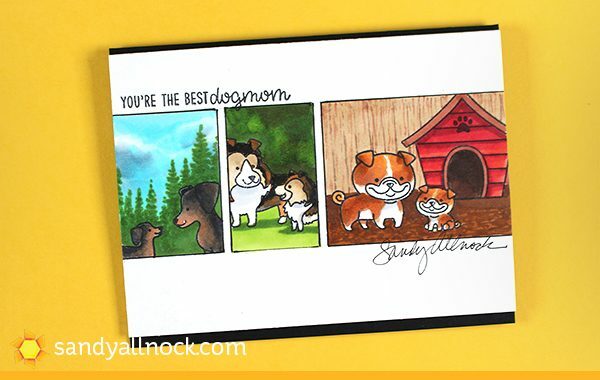 And this time – it’s with the cute Puppy Parents stamps I bought by Sunny Studio! 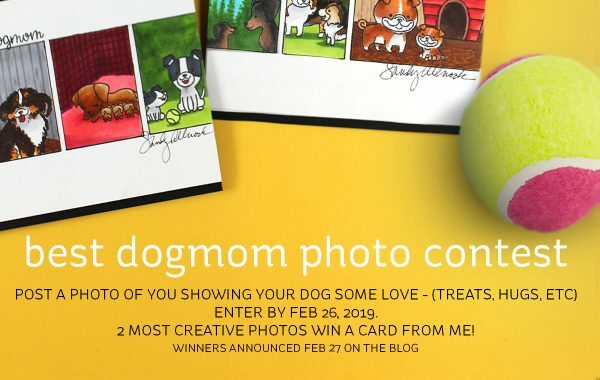 A little treat for you today: a giveaway contest for dog mamas! 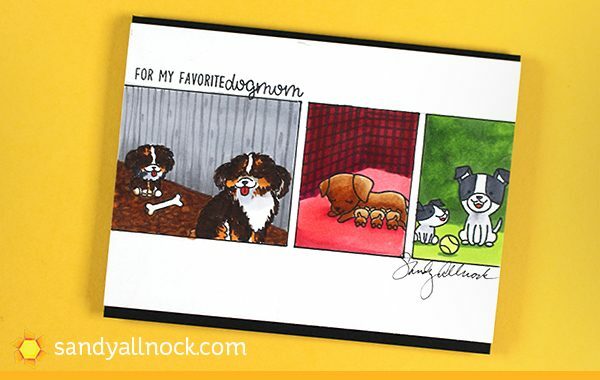 There are six breeds on the stamp set with mamas or papas and puppies – so I made two cards with the same idea. See below the pinnable graphic for a few extra tips! The little scene bits I used in these cards are taught in the Hex Art class – do my students recognize any of them? I changed the fluffy white pup into a Bernese!! Preferred: on my Facebook page, post it underneath the image of my two cards in comments there. (That way they all stay together). If you don’t have Facebook, then post on your blog, instagram, flickr, wherever, and put a link in the comments on this post. 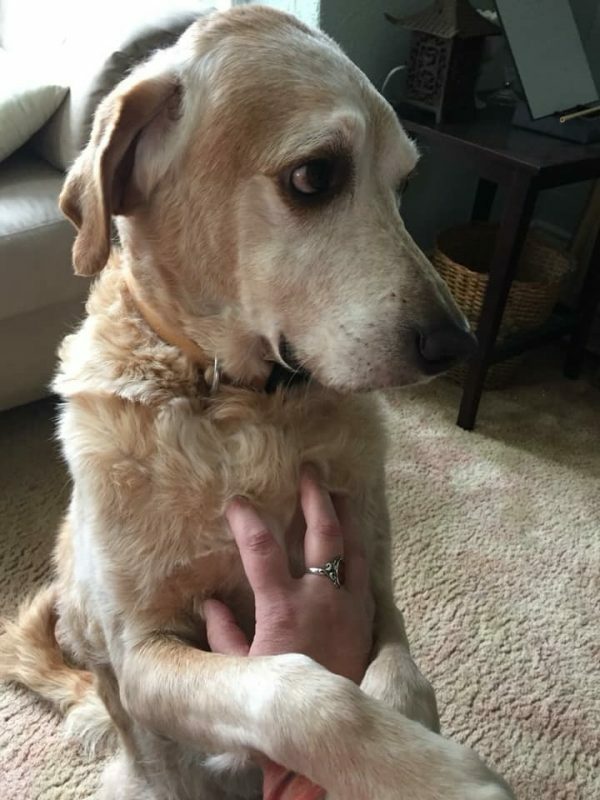 If you have no dog: go get someone you DO know with a dog to pose for you! You can keep the card yourself or give it to them. PS I’m not anti-cat.…but this stamp set has pups in it! If they ever make a kitty parents stamp set, we’ll do this again, ok? 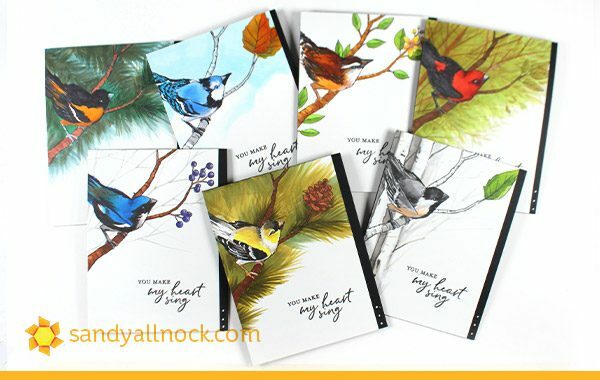 I often customize stamps to be what I’d like to see – and this Songbird stamp set has been on my desk for quite a while, knowing I’d make a bunch of birds out of the one stamp! 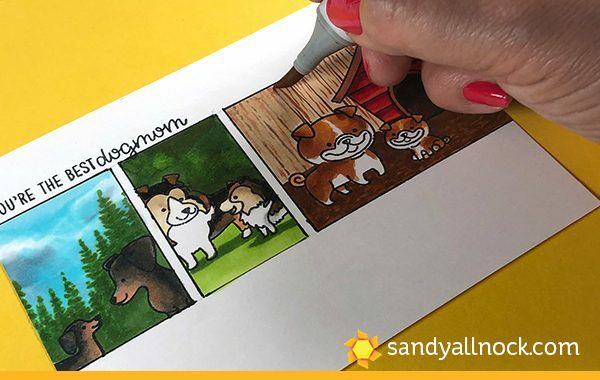 For those familiar with Copics, figuring out colors shouldn’t be all that hard….especially if you’ve taken Copic Jumpstart and learned about Glazing! 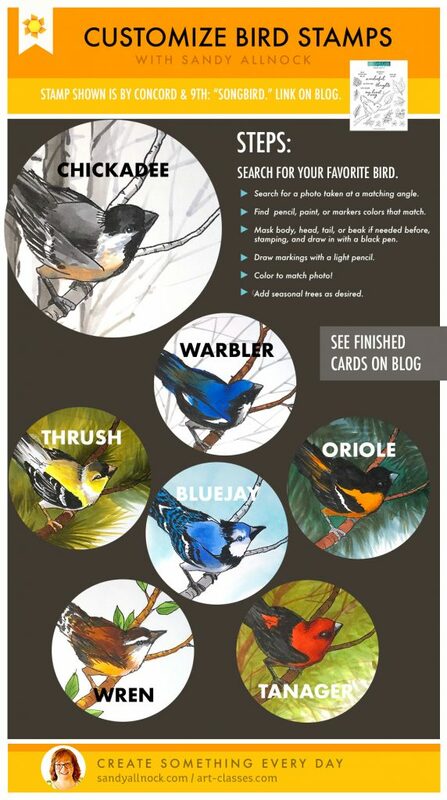 You can turn any of your markers into the right colors for any type of bird. 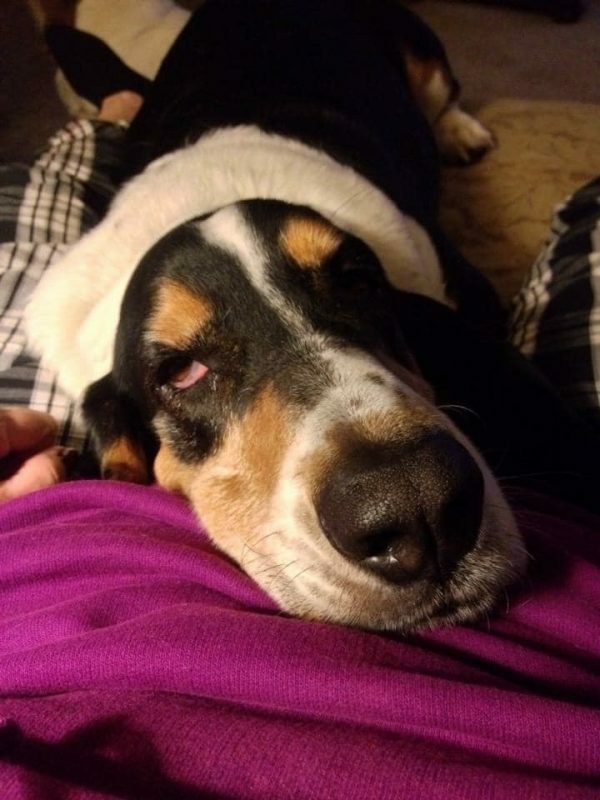 The tough part is the markings. Google the bird you want to draw, and you’ll get tons of images – then start scrolling to find a bird in an approximately correct position so you can see all the markings clearly. 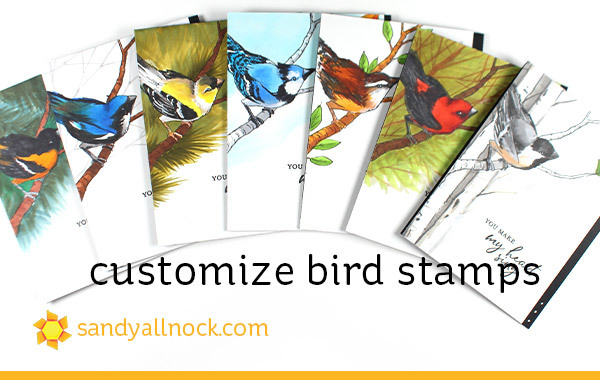 Some birds will have a longer tail, different shaped beak, etc – you can mask off those portions when stamping, or do as I did and just draw right over those parts!